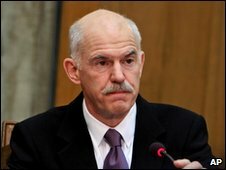 Mr Papandreou: Speculation "created a psychology of imminent collapse"
Greek Prime Minister George Papandreou has criticised the European Union's response to the country's financial crisis as timid and too slow. Mr Papandreou told cabinet members at a televised meeting in Athens that the EU lacked coordination and undermined Greece's credibility. At a summit in Brussels on Thursday, the EU offered Greece its backing but gave no details of any plans to help. Greece's debt crisis has put pressure on the euro, causing it to lose value. Speaking on his return from Brussels, Mr Papandreou said that while Greece had received a statement of support, delays and conflicting statements over the past few months had made things worse. "But in the battle against the impressions and the psychology of the market, it was at the very least timid, " he added. He said that speculation about the country had "created a psychology of imminent collapse". Mr Papandreou also accused EU institutions - the Commission, the member states and the European central bank - of a lack of coordination. After the Brussels summit, EU leaders said Greece must take further measures to tackle its huge debts and cut its budget deficit by 4% this year. Greece's deficit is, at 12.7%, more than four times higher than eurozone rules allow. Mr Papandreou said after the summit that his country was ready to take the extra action needed to reduce its deficit. Thursday's talks followed a public sector strike that brought many services to a standstill in Greece. 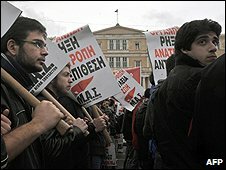 The government's decision to freeze public sector salaries and raise the retirement age are among the austerity measures that have angered Greek trade unions. Analysts say that powerful eurozone members such as Germany may be able to help by buying Greek government debt or by providing loan guarantees. But EU leaders appear reluctant to call on the International Monetary Fund to shore up the Greek economy. That would be a big blow to pride in the single currency. They have asked the European Commission to draft additional measures to be taken by Greece, "drawing on the expertise of the IMF". The EU will assess Greece's implementation of the austerity plan next month.